Review “Pine”: Pretty Damn Clever! 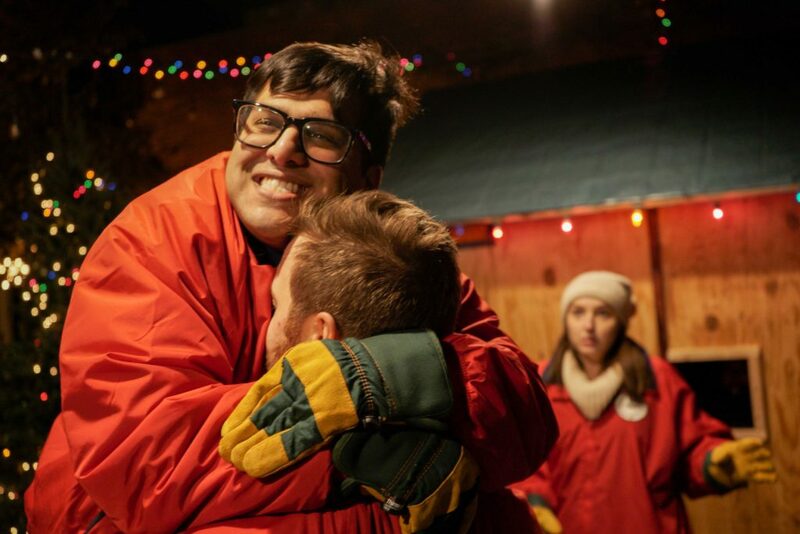 The U.S.A. premiere of PINE is at Uncommon Ground Edgewater for a limited holiday engagement. After seeing PINE at the Hampstead Theatre in London in January 2016, Director Arianna Soloway was inspired to bring it to Chicago. 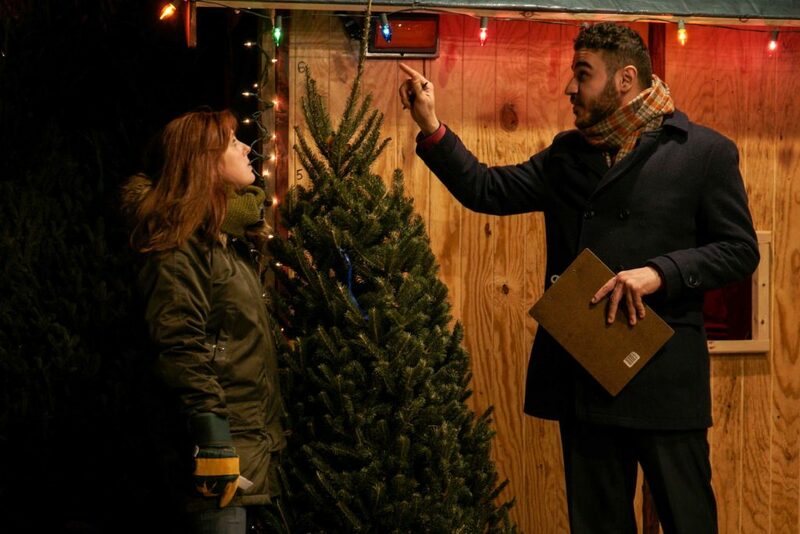 Soloway cleverly presents the play outdoors in a Christmas tree lot at Uncommon Ground Edgewater. The makeshift theatre has comfy van seats encircling the stage. Guests are given blankets. And hot season-themed beverages are available for purchase in Uncommon Ground. (I recommend Muddy Waters – vanilla bean house-infused whiskey, omanhene chocolate, espresso & steamed milk.) Trees, serving as theatre walls, with strings of holiday lights form an enchanting fort away from the cityscape. Carols playing muffle the street noises behind the trees. Even the full moon overhead cooperates to create a unique and magical Christmas fantasy. 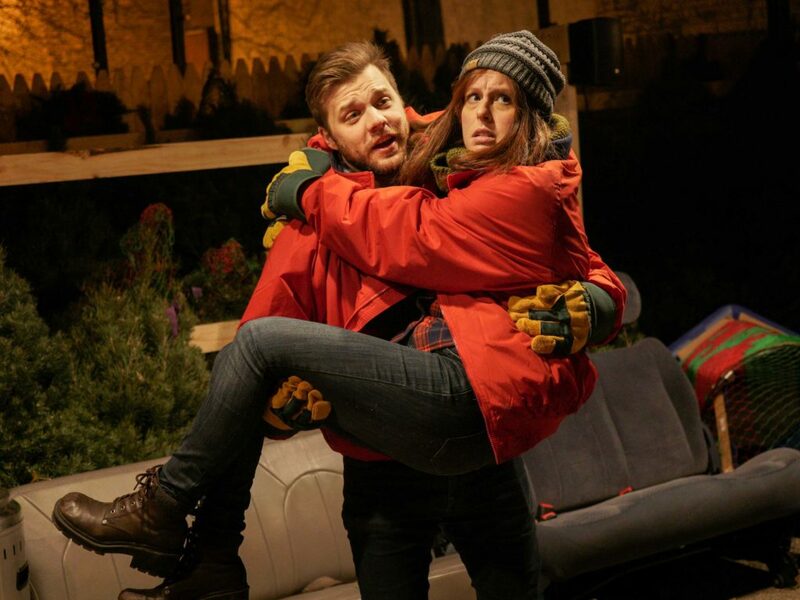 Within this monthly search for the perfect tree, Playwright Jacqui Honess-Martin showcases the realities of a fivesome’s desperate search for the perfect lives. 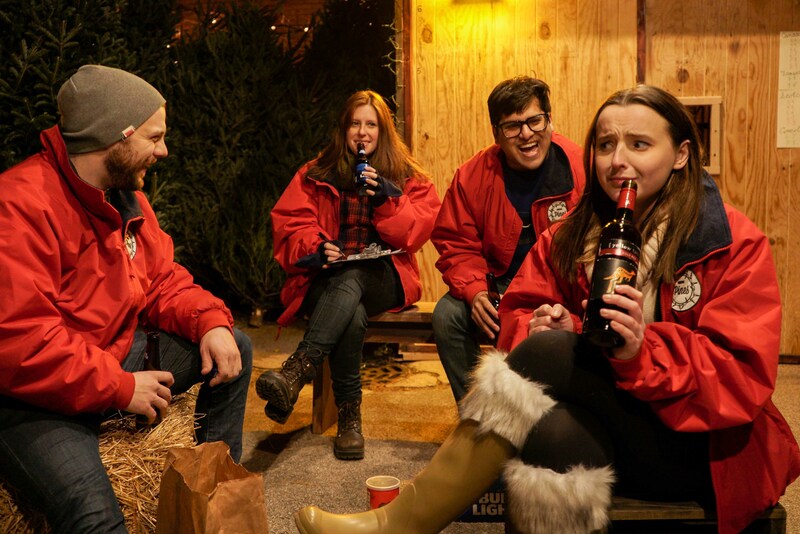 Honess-Martin pens a tale of millennials thrown together in seasonal work. The talented cast, Sunny Anam (Taj); Martin Hanna (Sami); Logan Hulick (Joe); Elise Spoerlein (Gabby) and Aria Szalai-Raymond (Betty), make this experience authentic. They juggle their personal problems with helping demanding customers find the ideal tree. Honess-Martin’s dialogue has the ensemble having serious conversations while fielding a myriad of requests from invisible customers. The cast makes us see what isn’t there. A lovely Szalai-Raymond squats down to help a tot adjust her tiara. An irritated Spoerlein referees tree conflict between buyers. A frantic Anam jumps into Hulick’s arms to escape a rat. We see the little girl, yuppies and that darn rat. Despite all the simulated tree sales, the story is really about the tree sellers’ lives. Their desires for their futures mirror the tree buyers’ desires for a perfect day starting with the perfect tree. Within the relational and career angst, barbs and zingers keep the laughs coming. Led by a sardonic Spoerlein and a high maintenance Szalia-Raymond, the show is a fun-rom-com-holiday escape. I really enjoyed this show! It was pretty damn clever. Yet, it’s too long for an outdoor show in Chicago in December. The night I went was 48 degrees. Two of the three heaters went out in act one. I had a warm beverage, warm blanket and winter coat. I was still cold in the mild winter temperature. The last thirty minutes, in particular, dragged for me. A series of short scenes with lengthy transitions was a belabored ending. I’d like to see this again next year if it is tightened up to 90 minutes with no intermission and working heaters. Tickets are $10 suggested donation or free with the purchase of a tree*. Tickets may be purchased at FestivePines.com. PLEASE NOTE: Performances take place outdoors. Heaters and blankets are provided, food and drink available for purchase at Uncommon Ground, audience members are encouraged to dress warmly.